Sunday, October 13, from 1 to 4. 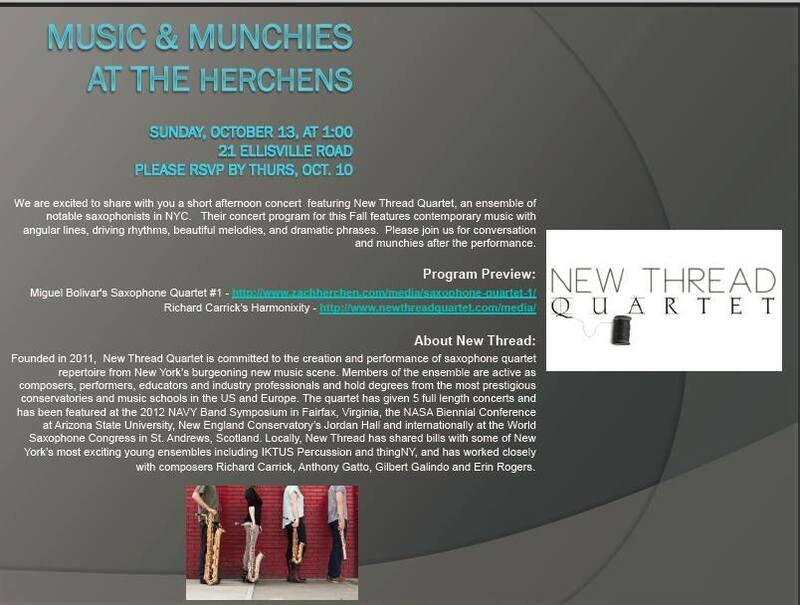 New Thread Quartet will give a short performance at the Herchen’s in Plymouth, MA. Please RSVP by Thursday, October 10. The recital will include vocal and chamber works as well as the world premiere of Kalb’s saxophone quartet “Ryden Scenes”. Join us for the final installment of the development series Short Form. A structured improvisational piece for a performer and a DJ using disparate textual sources, 25 musical selections and sounds, and over 50 objects as an investigation in the chaos of creation. Phase 1: Objects – curious ephemera or emblems of a lingering encounter? Evan and Chip are attempting to resurrect their past lives. The two best friends document their findings as they visit psychics, meditate, hold séances, undergo hypnotherapy and psychoanalysis, and learn just as much about their own messed-up relationship as the ones they might have had. Experimental music collective thingNY’s new set of operatic scenes opens with a soundscape of sirens, speech and singing, experienced from different perspectives depending on your seat and your time in the space. The scene depicts stories and philosophies from a community about to be ravaged by an approaching storm. In Zoom Thousand Time, BOOM BAT GESTURE applies the visual concept of an infinite zoom to time-based performance. Using a live 10 minute improvisation as source, BBG will zoom into/strech out one minute of each previous piece for all ensuing presentations, reducing the source material by 90% each time, culminating in a final performance using only the material that occurred in 3/5 of a second of the original source. Using this hyper-minimalist, ever-shrinking palette, they will navigate forms, existing and invented, in an effort to find freedom and expression under intense limitations.